Research on human immunology has been hindered by the lack of optimal small animal models, given that the protective immune responses of human and non-human species show significant differences. However, due to ethical constraints and the high cost of clinical trials, it is urgent to improve the current animal models that can mimic faithfully human physiology, particularly the human immune system (HIS). HIS mice had been generated recently by engrafting human hematopoietic stem cells (hHSCs) or human peripheral mononuclear cells (hPBMCs) into highly immuno-deficient mice such as NSG, NOG or NRG mice. However, a major experimental drawback for studies using these models is the rapid onset of Graft-versus-Host Disease (GvHD). 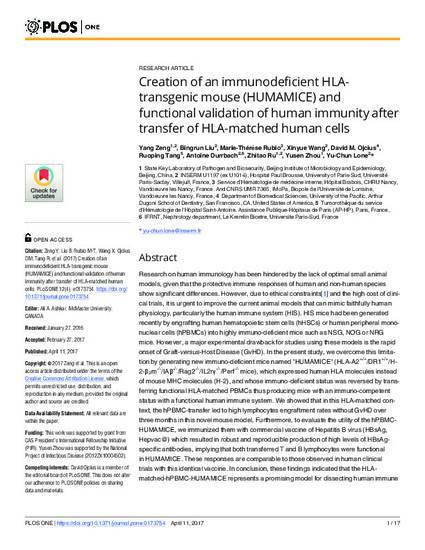 In the present study, we overcome this limitation by generating new immuno-deficient mice named "HUMAMICE" (HLA-A2+/+/DR1+/+/H-2-β2m-/-/IAβ-/-/Rag2-/-/IL2rγ-/-/Perf-/- mice), which expressed human HLA molecules instead of mouse MHC molecules (H-2), and whose immuno-deficient status was reversed by transferring functional HLA-matched PBMCs thus producing mice with an immuno-competent status with a functional human immune system. We showed that in this HLA-matched context, the hPBMC-transfer led to high lymphocytes engraftment rates without GvHD over three months in this novel mouse model. Furthermore, to evaluate the utility of the hPBMC-HUMAMICE, we immunized them with commercial vaccine of Hepatitis B virus (HBsAg, Hepvac@) which resulted in robust and reproducible production of high levels of HBsAg-specific antibodies, implying that both transferred T and B lymphocytes were functional in HUMAMICE. These responses are comparable to those observed in human clinical trials with this identical vaccine. In conclusion, these findings indicated that the HLA-matched-hPBMC-HUMAMICE represents a promising model for dissecting human immune responses in various human diseases, including infectious diseases, cancers and tumors, and to facilitate the development of novel vaccines and cellular therapies.